The first time I made marmalade was more than 20 years ago; it involved an expensive can of mix from Williams-Sonoma, and intense anxiety that everyone who received a jar would perish an agonizing death by botulism. That didn’t happen, of course, but the significant cost and dread involved was enough to send me back to the supermarket and its little imported jars of citrus delight. My success with several kinds of jam last summer alleviated the worst of my botulism fears; six months later, we’re still enjoying my Strawberry-Rhubarb Jam, with no signs of illness. Since I grew the rhubarb myself, it cost hardly anything to make. It remains crazy delicious; The Child refuses to allow me to give any of it away. She was willing to part with the Spiced Blackberry Jam, which my father seems to have taken a liking to. My true love, though, is marmalade. There isn’t a lot of jam-type fruit at the stores currently, but when February rolled around, I began my annual hunt for blood oranges, and as I was doing so ran across boxes of Meyer lemons at Costco. I don’t know a thing about Meyer lemons, but the internet told me they would make many lovely things, especially marmalade. I began with this Meyer Lemon Marmalade recipe from Serious Eats. Now, my experience with making marmalade is admittedly limited – not counting the mix, I’ve made it once – but I know a few things. For example, you don’t need pectin to make marmalade. I also have bad experiences with recipes that suddenly tell me to include add ingredients that they haven’t mentioned on the ingredient list. I know better than to attempt recipes that spring unspecified quantities of candied ginger on me partway through, and I certainly know better than to add butter to marmalade before toast has come into the equation. I may not have made much marmalade, but I’ve eaten enough of it to know how it should work. I move on, pleased that I’ve increased my kitchen confidence to the point where I can look at a recipe and know that I’m right and it isn’t. But I like the idea of including ginger in the marmalade – mostly because I like the idea of adding ginger to anything – so I search out Meyer Lemon Ginger Marmalade recipes, and find this one on Williams-Sonoma’s website. It suggests using a mandoline to slice the lemons. I don’t own a mandoline, but I’ve been looking for an excuse to buy one, and as an added bonus, Amazon is trialing same-day delivery in my area and offering a coupon for a free trial, which will spare me the trouble of leaving my home to use these lemons before they go bad. I order a highly rated mandoline that is available for the same day offer, and it arrives as expected, at 7pm that night, along with a box of gel pens and a wall-mounted broom organizer. Five days later, I make marmalade. I start out slicing the lemons with the mandoline, which seems like it should be a straightforward process, but isn’t: There’s juice everywhere, and the mandoline leaves large end pieces lemon peel over. It could be that the recipe’s instructions are at fault, since I believe it’s by now well established that there are no requirements that anyone actually follow their own recipe instructions before posting said recipe on the internet. It could be the Amazon reviews, which often have no relationship to the product whose page they are posted on (“Well packaged, but I ordered red and this is blue.”). Or it could simply be that I have some especially juicy lemons on my hands – all over my hands, the counter, and the floor, as it happens. Whatever the issue, I have a Costco case of Meyer lemons that are nearing their expiration date, so I research a little further – after washing my hands, obviously – and locate a very simple recipe for Meyer lemon marmalade from Gourmet magazine. I then take out my trusty chef’s knife, slice the lemons as thinly as I can, and mostly follow the directions. The directions call for simmering the lemons for 45 minutes, then adding sugar, but by the time I got to that stage of things, I simply added the sugar and set the pan to simmer, then realized I’d done it in the wrong order. I still have more lemons, though, so after I’m done canning the first batch, I slice up more of the lemons, leave them to soak for 24 hours, and the following evening, make a second batch of marmalade, following the directions more closely. The second batch of marmalade was lighter colored than the first, and less sweet – not surprising, since the sugar didn’t cook down and concentrate the way it did in the first batch. Both were excellent, with a wonderful peel-to-jam ratio. I still have more lemons, as well as nine jars of marmalade. Even I can’t eat this much marmalade, so I begin sending it around the country, to friends and family – it turns out there are more marmalade lovers among them than I knew. But what’s not to love? 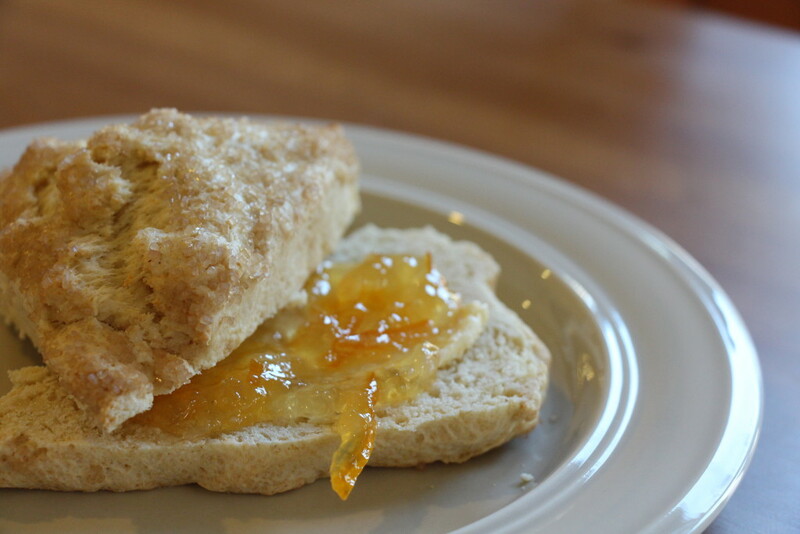 This is lovely on scones or a crispy, buttery English muffin. Halve lemons crosswise and remove seeds. Tie seeds in a cheesecloth bag. Quarter each lemon half and thinly slice. Combine with bag of seeds and water in a large heavy pot and let mixture stand, covered, at room temperature 24 hours. Add sugar to lemon mixture, and bring to a boil over moderate heat. Reduce heat and simmer, uncovered, about 45 minutes. Stir occasionally, skimming off any foam that appears. Marmalade is ready when until a teaspoon of lemon mixture dropped on a cold plate gels. Ladle hot marmalade into jars, filling to within ¼ inch of top. Seal jars with lids, and process 15 minutes in a boiling water bath. The original recipe calls for adding the sugar after the lemon-water mixture have been boiled for 45 minutes. Boil an additional five minutes, then begin checking if mixture gels on a plate, and proceed with directions. Both methods work fine; adding the sugar earlier will result in a sweeter marmalade that is darker in color. Adding the sugar later will result in a lighter taste and color.